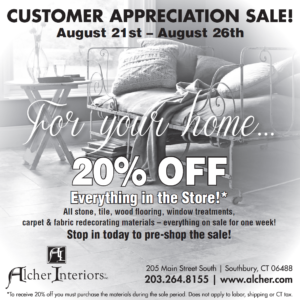 Alcher Interiors August 2017 Customer Appreciation Sale | Alcher Interiors, Inc.
Beginning August 21st, our Customer Appreciation Sale offers 20% OFF everything – including our entire stock of stone, tile, wood flooring, window treatments, carpet & fabric redecorating materials and more. Everything will be on sale for one week only! If you have some home redecorating or design projects in mind, we recommend stopping in this week to pre-shop the sale, since the store-wide 20% OFF only lasts August 21-26.